Chapter benefits include regularly scheduled meetings. Please refer to the calendar for up to date information on meeting dates and locations. Each meeting features expert speakers, ample networking opportunity, and beverages/appetizers. The meeting agenda includes regular segments such as Advancing Philanthropy, Professional Ethics, Getting to Know You, Today's Program, and Tools of the Trade. The meeting is included at no cost for members and $20 for non-members. No charge for visitors and guests attending for the first time. Non-members can register by contacting Sheila Rainey at 507-696-1881. Social and professional networking precedes and follows each meeting. Appetizers or dessert are served. There is no cost to attend meetings for members. Non-members can attend once at no charge and $20 thereafter. In addition, regularly scheduled networking opportunties are held on the altering months that a chapter meeting is not scheduled. The chapter participates in the AFP International Webinar program. This training resource engages world-recognized speakers on a wide range of development topics. 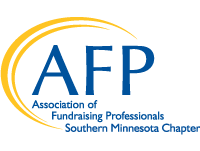 Fundraisers in the region can attend AFP Webinars in addition to regular chapter meetings to enhance professional development. Webinars are regularly scheduled, typically the first Tuesday of each month over the noon hour, to provide access to cutting edge ideas brought to you by some of the world's premier fund development professionals. Webinars are available at no cost to members and $20 for non-members. Non-members can register by contacting Jennifer Teske at jennifert@uwolmsted.org or by phone at 507-287-2003. For a list of upcoming webinar topics, view our events calendar. As AFP Southern Minnesota grows, leadership and volunteer opportunities are available for members. The activities of AFP Southern Minnesota can have a lasting positive impact on the future of philanthropy in our region. Volunteer opportunities are available for membership services, National Philanthropy Day activities, professional advancement and programming, and scholarship programs. If you are interested in volunteering with AFP, contact Chapter President, Neal Engelman at nengelman@wradvisors.com.